I'm brazilian, and I'd suggest you guys to drop the ham and get some nice smoked sausages (won't ever substitute the gelatin in pork ears or feet, which is what we use to get the consistency right, but it'll taste more legit) instead. This recipe takes about 1 hour to cook in a pressure cooker (which is how most people cook beans in Brazil, housewives haven't got all day to cook and rice and beans are a daily staple). Nowadays there are even electric pressure cookers with timers, which are safer. The feijoada will be perfect when the beans are very well cooked, turning into paste when you smash them. 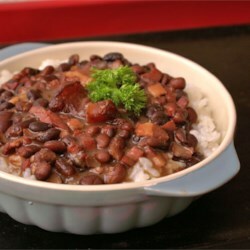 If you want the feijoada creamier, you can smash some of the beans and stir while it simmers for a bit after cooking it.